There’s nothing like fresh, ripe berries picked in the field! 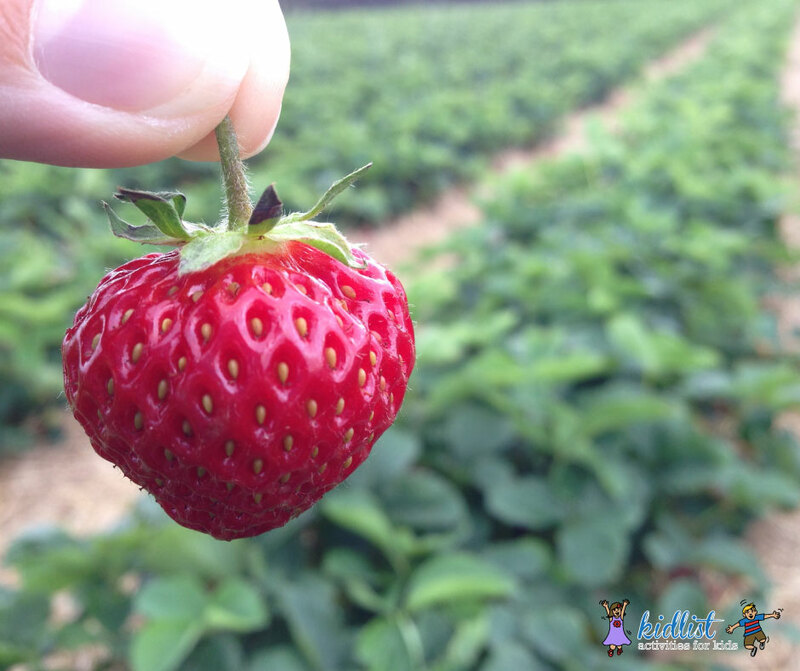 Strawberry picking is such a fun and educational experience for families to enjoy. It is especially easy on little kids because the plants are low to the ground and very accessible for little hands. Use our guide to find U-Pick strawberry fields within driving distance of Chicago. We’ve also have provided gathering tips to make the experience more enjoyable before and after! The strawberry season usually begins in mid-June and continues for 3–4 weeks depending on the weather and how many people come to pick. This can vary with weather patterns, so it is best to check with the farm you are planning to visit to find out when they expect to open for the season. Most farms recommend checking their Facebook page or calling beforehand for more up-to-date information regarding their crops. We have provided the most up-to-date information possible for each farm, but please call ahead or check their site for further information. U-Pick begins June 11, 2018. Strawberry Madness Festival every weekend in June with activities. $2 donation per person for entry. Hours: Monday-Saturday 8:00 am – 7:00 pm, Sunday 8:00 am – 6:00 pm. Call before arrival to be sure strawberries are ripe and still available. U-Pick Target Date: June 15, 2018; check Facebook or call for exact date. Hours: Monday – Friday 9:00 am – 6:00 pm, Saturday – Sunday 9:00 – 5:00 pm. U-Pick Target Date: 1st or 2nd weekend of June; check Facebook or call for exact date. Hours: Daily 9:00 am – 5:00 pm. U-Pick Target Date: Mid-June; check Facebook or call for exact date. Price: $4 for a 1-quart basket, $6 for 2-quart basket, $12 for a 4-quart basket. A $4 minimum strawberry purchase per person is required to enter the strawberry patch. Hours: Daily 8:30 am – 5:00 pm. U-Pick Target Date: 2nd week of June; check Facebook or call for exact date. U-Pick Target Date: Middle of June; check Facebook or call for exact date. Price: $9 per 4 quart basket (cash only), pick 6 baskets and pay for 5 baskets. Hours: Monday-Friday 8:00 am – 6:00 pm, Saturday-Sunday 8:00 am – 4:00 pm. Hours: Daily 8:00 am – 5:00 pm. Hours: Monday – Tuesday CLOSED, Wednesday – Friday 9:00 am – 2:00 pm, Saturday – Sunday 9:00 am – 4:00 pm. Hours: Tuesday-Saturday 9:00 am – 6:00 pm, Sunday 12:00 pm – 5:00 pm. Hours: 9:00 am – 5:00 pm. U-Pick Target Date: June 7 or 8, 2018- call or exact date. Call for hours and days of U-Pick berries. Hours: Daily 7:00 am – 6:00 pm. U-Pick Target Date: Late June; check Facebook or call or exact date. U-Pick Target Date: June 8 or 9, 2018; check web site or call for exact date. Hours: Daily 9:00 am – 5:30 pm. U-Pick Target Date: Mid-Jun; check Facebook or call for exact date. U-Pick Target Date: Mid-June; check Facebook or call in June for update. Hours: Wednesday & Sunday 9:30 am – 2:00 pm. Always call before you go picking to verify hours and crop availability. Ask if the fields are picked over or still have a decent amount of strawberries left to pick. Some fields are picked clean by lunchtime on the weekends! It is important to know that the length of the season is greatly affected by the weather, especially with berries. Some farms do not supply containers, while others require that you use their supplied containers. Find out what your chosen farm prefers and be prepared. I also recommend asking when the fields were sprayed. Sometimes, freshly sprayed farms make it less appetizing for sampling as you pick. It’s way more fun, especially for the kids, to pick if you can taste along the way! Consider the heat and sun while picking. There often aren’t trees around strawberry fields so the berries can receive full sun, which means you will get full sun too! This may mean wearing a hat while picking, wearing sunscreen, and light clothing. You may also want to bring or apply bug spray before going as well. Pack water, and drink often! Bring a picnic lunch, or at least a snack and a blanket to eat on. Don’t wear nice clothes or shoes. Especially with kids you almost always get strawberry juice on your clothes. Usually there is straw or mulch between the rows of plants, but depending on how much rain there has been, there could be mud underneath too. Unripe berries will not ripen once picked, so pick strawberries that are bright red (no white tips) but pass up the ones that have bruises or are mushy. The size of the strawberry will not affect its sweetness. Many strawberries ripen under the leaves of the plant, so it helps to gently lift the leaves to look towards the center of the plant. Strawberries keep better if you pick them with the cap and stem on. Pull the strawberry at the stem with a slight twist and it should come off with the cap and stem. Don’t stress about it too much though because they are still fine without the cap and stem. Don’t wash your strawberries until you are ready to eat them. Washing makes them more prone to spoiling. Wash in cool water to remove dirt and store in the refridgerator. To freeze your strawberries: wash and hull them (cut off the green part and remove the core), dry them really well by patting them dry or laying them out to dry on your counter. Lay them on a cookie sheet covered in wax paper and put in freezer. When completely frozen, transfer them into ziplock bags, removing as much air as you can. Strawberries will be slightly mushier than other frozen fruits when unfrozen, but they are still delicious. Berries can keep for months in the freezer, so don’t hesitate to freeze extras! For more ways to get out and enjoy the fresh air as a family, check out our outdoor activities page. 2 Comments on "Strawberry Picking: Farms With U-Pick Strawberries (Plus Map!)" We can’t wait to try this…never have. Would you mind sharing a favorite of these? There are so many to choose from! We have gone to Thompsons and had a good experience there, but I’m considering trying a new place to explore and compare. I’ve definitely learned how important it is to call before going. The two most important things to ask in my opinion are: When is the last time you sprayed? (I don’t feel good about my kids sampling berries as they pick if the fields were just sprayed the day before) and How are the picking conditions? If it’s towards the end of their season there is a good possibility that picking will be frustrating and you will spend more time bending over and searching for berries compared to actually picking. That happened to us last year because we went too late. Maybe others can chime in too?